Revillusion® Flame Technology – Flames are larger, brighter and more random, appearing from within the logs. Mirage™ Flame Panel – Partially frosted acrylic panel is clearly better than a mirror, showing only dazzling flames and no reflections. 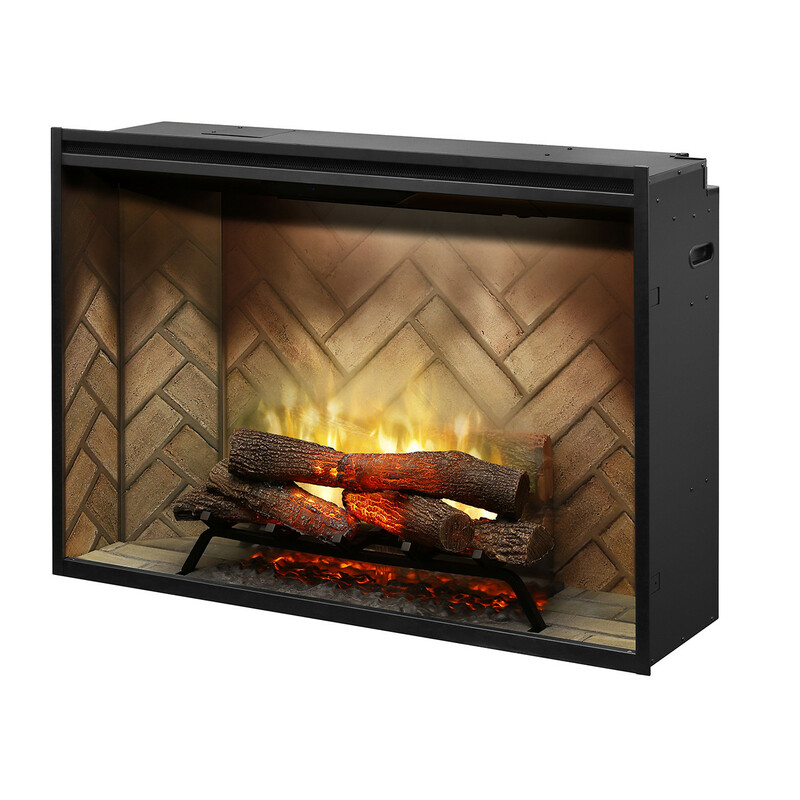 ThruView™ Full-depth Design – See clear through the flames to the back of a masonry fireplace for a more authentic experience. Color Enhancement – Adjust the flame base color to red or blue. Mood Lighting – Customize the firebox glow with a choice of warm hues, plus midnight mode. Brightness and Flicker – Adjust light level to suit the room and choose flicker effect for enhanced firelight. Realogs® Plus – A full grate of life-size hardwoodcast logs, tiered for greater depth. Hidden Heat – Fan-forced ceramic heater provides hidden comfort for any space. Direct-wire – Designed to be direct-wired to a 120, 208 or 240 volt circuit for a seamless look (optional plug kit available). Double Glass Doors – Functional doors with tempered glass. Single Glass Pane – Tempered front glass. RBFPLUG – Optional 120V plug kit for RBF fireboxes.